Educational responsibilities for and inside public schools are far greater and more complex now than ever before, and we hear more about the need to “build capacity.” In its scientific definition, “capacity” is described as the maximum amount that a container will hold. Yet capacity need not be as finite as the amount of coffee brimming in your morning mug. Rather, I like to envision a type of capacity that can expand, and even overflow, much like our brains’ capacity for knowledge, or our hearts’ capacity for love. A recent survey by the Fordham Institute of 1,200 English language arts teachers found troubling signs in reading and writing instruction in America’s schools. For example, middle and high school teachers have become more likely to assign texts based on students’ current reading levels instead of their grade level. As we see, the current demands on educators require them to expand greatly, and in some cases, there’s unintended overflow when they’re not given adequate time and resources to adjust instruction based on research-based practice. Let me offer a reflection on how my 15-year involvement in AFT professional development has helped to build capacity in my own local, in my state and around the country. In 2003, I was invited to attend AFT’s Beginning Reading Instruction Train the Trainer at AFT’s Summer Educators Institute. I left feeling empowered by the significance of the research and enthusiastic to try all of the new strategies! I returned to my district and immediately began to practice and reflect on the many new instructional techniques I had acquired. Within weeks of my return, my district was awarded a reading grant to provide training for all of the K-3 teachers in my school. It seemed a natural fit to use the AFT Beginning Reading Instruction module. So, I was paired with another local trainer to provide the course to more than 30 teachers in my building. Their reaction to the training was extremely positive, with many teachers acknowledging that they had never had this level of research-based training during their pre-service courses. Within a year of implementing the Beginning Reading Instruction course in my own district, the state of Rhode Island was awarded a national Reading First grant to provide professional development to teachers statewide. Over the next several years, I was one of the AFT national trainers who provided professional development to more than 500 teachers from all around the state. Educators routinely express that it is the finest professional development they have ever experienced and offer gratitude for the union’s support! Becoming an AFT national trainer also piqued my interest in literacy research and propelled my own professional growth in the field. I became a certified teacher of dyslexic children and adults (Orton-Gillingham) and eventually became my school district’s PK-12 Literacy Standards implementation coordinator. Over the years, I’ve been a thought-partner at many national meetings related to reading instruction and literacy, and I was a participant on the national feedback team for the ELA Common Core State Standards. Continually growing my knowledge base in the area of reading instruction helps improve my personal practice while training and leading course updates allow me to collaborate and mentor colleagues from schools across the state. Today’s mandated top-down education reforms have pushed the upper limits on educators’ capacities for years, causing early burnout and a sweeping exodus from our profession. 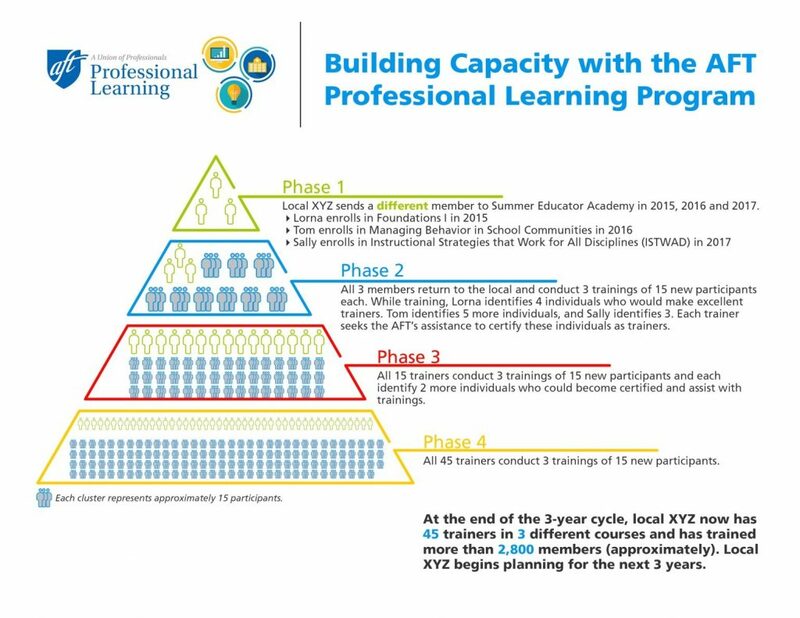 The AFT professional development program’s train-the-trainer model supports overwhelmed educators by sharing the best methods to reach the greatest number of students for maximum impact. This can be accomplished by embracing an expanded capacity model such as the one found in the AFT’s professional development. If you’re a district leader or administrator and you’re interested in AFT professional development, check out this guide for recommendations on how to build and sustain a successful professional development program. Free resources and lessons are also available on Share My Lesson. Members can access professional learning courses on our e-learning platform. Patricia D’Alfonso is a newly retired educator from the West Warwick (R.I.) Public Schools with 39 years in literacy education, and is a national reading and writing trainer for the AFT. D’Alfonso is a union activist who is the executive vice president of the West Warwick Teachers’ Alliance, and serves on the professional development cadre of the Rhode Island Federation of Teachers and Health Professionals. OECD. (2016). “Overview: Policies and Practices for Successful Schools.” PISA 2015 Results (Volume II).